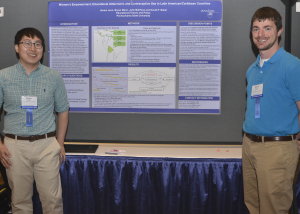 HaramJeon and Bryan Mann presented their paper (with Julia Mahfouz and David P. Baker) titled “Women’s Empowerment, Educational Attainment, and Contraceptive Use in Latin American/Caribbean Countries” at the 2015 Population Association of America (PAA) research conference in San Diego, California. The team demonstrated that educational attainment has an independent effect on contraceptive use across several countries. The poster won an award ribbon for best poster in their session!